Most grow lights come with recommended guidelines, but your needs may vary from setup to set up (and even sometimes from plant to plant). As a general guideline, you should start with the guidelines suggested by your grow light manufacturer, usually 18” to 24” away from the plant. Then, keep a close eye on your plants for signs that the light is too close or too far away. 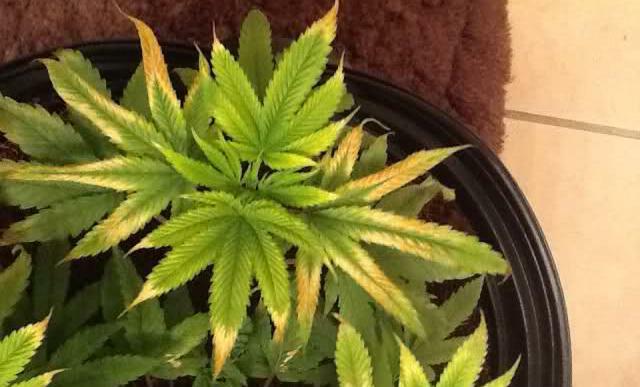 A plant that is too close to the light will experience light burn, which you’ll notice by the bleaching or yellowing of the leaves and curling/drying of the tips, especially on the top leaves nearest the light ( see image below ). If you see this, it’s a sign that your light is getting too much light. Inch your grow light back until you see an improvement. (Note the discoloration and dry, brittle tips on the top leaves of this plant, which was too close to the light. Alternatively, if you notice that the stem of your plant is stretching and looks like it can’t support itself, it’s too far from the light source. Move your light a little bit closer and you should see the upward growth slow down. Ideally, you want your plant just outside the distance that it starts to bleach. This is the “sweet spot” for maximizing your plant’s growth. If you’re looking for something a little more scientific than the eyeball method, you can really maximize your plants’ potential by knowing the PAR Output of your light. By learning this mathematical formula, you can ensure that your plants are eating the perfect amount of delicious, full spectrum light.